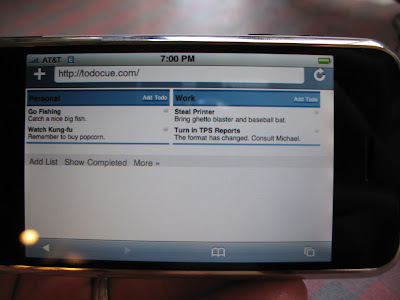 I shot these while at dinner last night with an awesome group of Chicago techies: iPhone and Neo1973 iPhone showing TodoCue The idea of a simple todo app for the Neo1973 was the original inspiration for TodoCue's creation and design. It doesn't render as well on the Neo as the iPhone, but that will change. 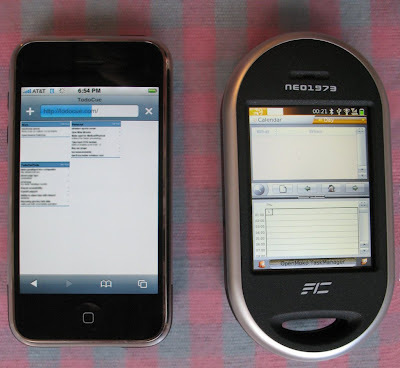 I need to read up on how to support double clicking and DnD on these devices. I bought a prepaid sim card off eBay for $6 at Harper's suggestion. I'm psyched about the applications we can create on the mass-market Neo1973 coming in October, with it's GPS, accelerometers, 802.11, accelerated graphics, and free platform.